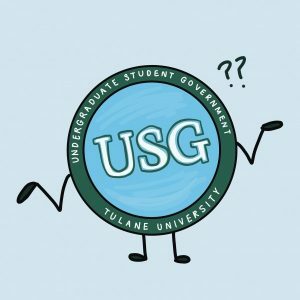 With the results of the Tulane Undergraduate Student Government elections finally in, an appropriate question arises: What is the actual impact of Tulane USG on student life? As Tulanians, it was difficult not to notice the large swaths of students campaigning for student government positions last week on McAlister Drive. Beyond some simple voter perks and stump speeches, how do student government members actually impact our lives? Though Tulane’s USG was responsible for the green initiative, which removed complimentary plastic bags at McAlister Market, Tulane USG has little to show for its conspicuous campaign efforts other than a few generic ploys to combat climate change and inform students of their rights. Indeed, student governments at other universities have dedicated themselves to improving student life quality. According to the homepage of Florida State University’s Office of Student Sustainability, FSU-elected Student Government Association leaders sponsored an initiative to sell fresh produce for their students on campus. Though Tulane Dining Services sponsors a similar initiative for Tulanians, Tulane’s USG is noticeably absent in vouching for such programs which benefit their constituents. To improve its reputation, Tulane’s USG ought to take steps to reach out to the people it serves. Instead of relying on social media to connect with students, USG ought to hold actual events and activities which actually seek to make its presence known to the undergraduate student body. Without a meaningful effort to actually state its mission and goals to students, lackluster turnout will continue to define USG and Tulanians will remain disinterested. “We need to increase communications with the student body about our actions. This will make USG less mysterious and more transparent,” said USG president-elect Joseph Sotile. “By clearly providing updates on the initiatives we are working on, more people will be able to stay up to date and potentially get involved with our efforts to improve campus life.” Despite Sotile’s impressive plans, it remains to be seen whether USG can collectively reform its hobbled image. If Tulane’s USG seeks to actually serve a purpose and improve on-campus life, it should begin brainstorming how to sponsor actual initiatives which benefit Tulanians. Lobbying for better student dining options or reforms to student conduct policy would be a good start, but USG’s sole purpose should not be to simply campaign for elected positions. If Tulane’s USG can begin reinventing itself and its mission, perhaps student interest for this organization will increase. Are you aware that USG is responsible for Bruff to Go, the Tulane University Legal Assistance Program, the outdoor classroom, the recycling bins outside Bruff, the bystander intervention / alcohol safety signs on Freret, the water bottle refilling stations, the gender inclusive bathrooms in the LBC, the PJ’s booths in the library, the upcoming recording studio, the upcoming 24/5 library, (I can keep going if you like)? Really disappointed in the complete lack of research supporting this defamatory article. Did you know that USG is responsible for funding and approving over 200 student organizations on campus? Did you know that USG senators represent the student opinion on a number of campus and University Senate committees to help make change through the established institutions? Did you also know that USG holds student forums, Get TU Know Your Senators events, and accessibility campaigns every semester? Did you see USG’s Student Life survey, or the regular tabling? Did you know that USG has been rated #10 for Most Active Student Government by the Princeton Review? The best way to ensure that USG is making an impact on your student experience is by getting involved, not by writing smear articles. The author could have done the minimal amount of research by literally just looking at the Hullabaloo’s past articles and this piece would have been more informative than a pitiful smear attempt. Aside from that, if anyone is actually interested in what USG does on this campus look at all of the other articles the Hullabaloo has written. They cover a variety of different changes and projects USG has brought to Tulane. Don’t let the incompetency of one writer inform your entire mindset. I would unironically prefer the USg be dissolved and we just have one administrative employee allocate group funds. It’s a waste of time and resources. Really hilarious to see other commenters mentioning “water refilling stations” “posters” and and “the outdoor classroom” as if these are impressive feet’s instead of useless and wasteful spending of our tuitions.